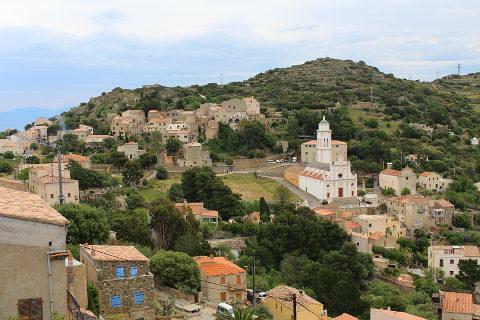 Corbara, Pigna and Aregno are three pretty hill villages in the northern part of the Balagne region in the north of Corsica. There are many villages to explore in the hills and these are a group of three that are fairly close together. 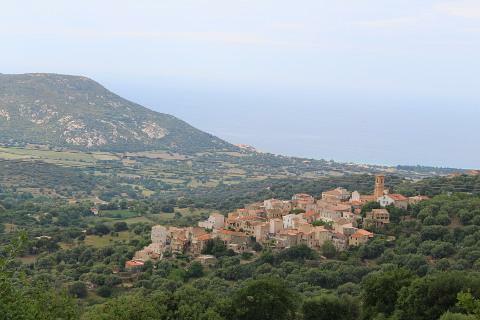 The villages lie inland of the coast between Calvi and L'ile-Rousse. Corbara is a quaint little village which is really made up of 2 hamlets in close proximity; Pietralta and U Borgu. Park in the square at the lower-middle part of the village by the Bar de la Place and walk up the pretty cobbled path lined with stone walls that leads to two churches in the Pietralta part of the village. The path passes a scattering of cacti, orange trees, fig trees and the geraniums that grow to the size of medium shrubs here in Corsica! This path leads to the church of the Annunciation which is a baroque building built in the 17-18 centuries. Right next to this is another baroque religious building - the Oratory of the Penitents of Saint Anthony. 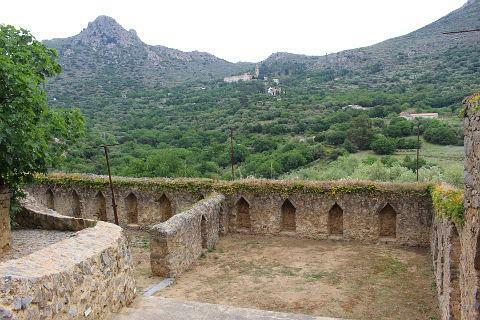 However our favourite church was the Moorish Chapel of Our Lady of Sorrows in the U Borgu part of the village. You can see this chapel sat on the hill above the rest of the village and involves an uphill walk of 5-10 minutes to get to it. 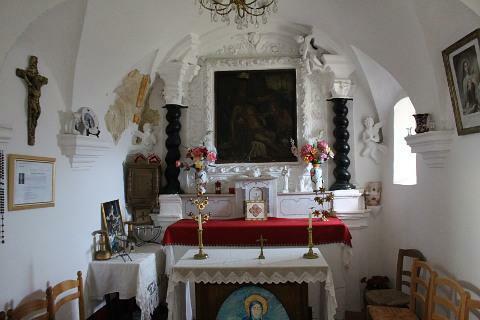 The inside is painted white and is very small and simple and has a marble statue of the Madonna and child which is apparently covered in a modest dress all year and just taken off for the feast of Our Lady of Lazio in October. From here you get far reaching views over the surrounding hills and over the sea. You can see the seaside town of Algajola from here. It is also on this spot that Pascal Paoli stood and decided on the location of the town of L'isle Rousse. There are two museums in Corbara. The treasury museum is linked to the church of the Annunciation and contains religious art. The museum of Guy Savelli is close to the church and contains items of art and history. It is open every afternoon and is free to enter. 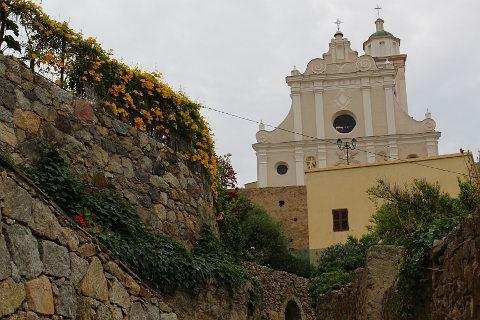 Pigna is a very pretty village which has been beautifully restored. It is totally pedestrianised with parking at the edge of the village. 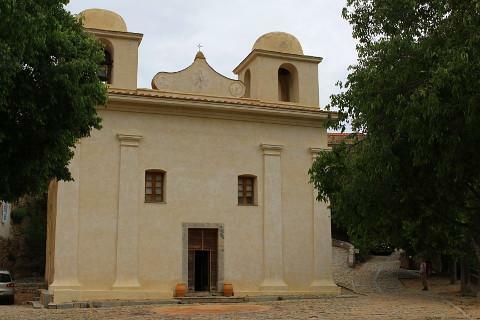 Wander round the village to enjoy its pretty architecture and look inside the church which contains a modern fresco and a small marble statue which are of interest. Pigna began life in 862 when a lieutenant sent by the pope to free Corsica of the Saracens built a tower named Pigna in memory of Rome, his birthplace. 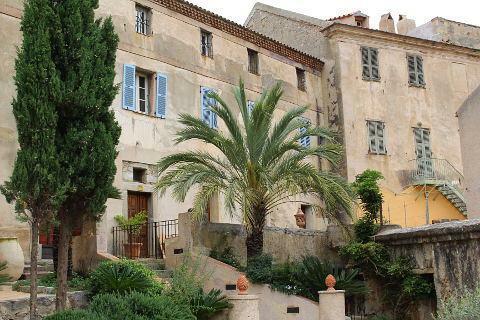 The restoration of the town is an excellent blend of old and modern and a lot of attention has been paid to conserving architectural features such as the blue louvred shutters and the balantine guttering. The town is now a thriving centre for music and art and holds many concerts many of which are held in the old cattle pens that have been transformed into an open air auditorium. Pigna has very pretty views over the sea and the neighbouring village of Corbara. Aregno is a small village whose most interesting feature is its lovely 11th century church slightly outside the village. This has been built in Romanesque-Pisan style and has the stripy black and white stone pattern that you see in churches in many parts of Tuscany. The Trinity church also has some interesting black stone statues on its facade. The church can be found about 40 meters further up the hill than the rest of the village. 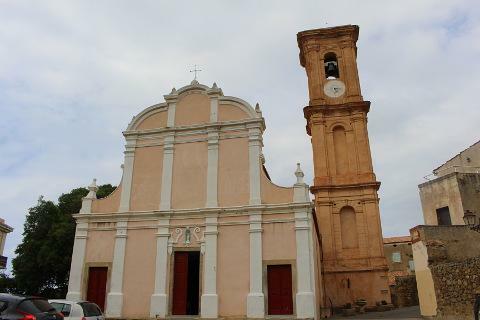 In the centre of the village there is a Baroque church with a tall stone bell-tower. Whilst the village is very quiet a time to see it at its most lively is during its annual almond festival at the begining of August. The hills around the village are covered in almond trees as well as olives and orange trees. 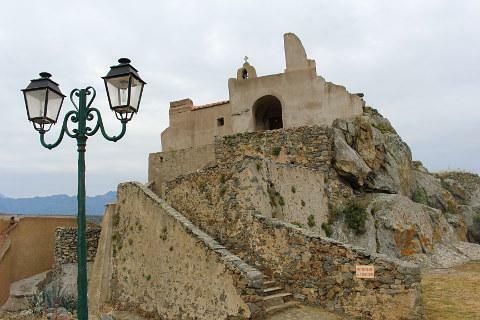 See our Balagne guide for more proposed routes through the Balagne villages. Don't miss Sant Antonino which is one of the Balagne villages and is classified as one of France's most beautiful villages.